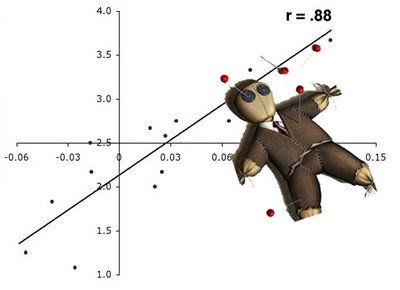 Voodoo expert Dave Rowley made me aware of a post on voodoo correlation in social sciences: see here. Neurocritic is a blog that deconstructs the most sensationalistic recent findings in brain imaging, cognitive neuroscience, and psycho pharmacology. Clearly, we need to be careful when analysing imaging data, especially when correlating to other variables. And I am sure some brain imaging studies on stuttering have problems, too.